Explanation: The Moon almost ruined this photograph. 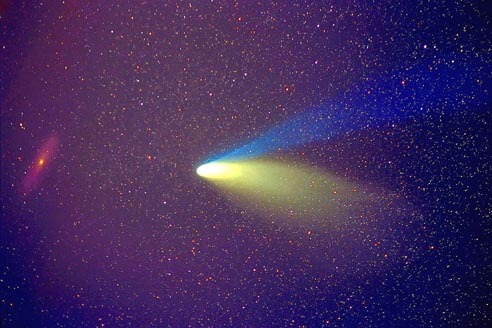 During late March and early April 1997, Comet Hale-Bopp passed nearly in front of the Andromeda Galaxy. Here the Great Comet of 1997 and the Great Galaxy in Andromeda were photographed together on 1997 March 24th. The problem was the brightness of the Moon. The Moon was full that night and so bright that long exposures meant to capture the tails of Hale-Bopp and the disk of M31 would capture instead only moonlight reflected off the Earth's atmosphere. By the time the Moon would set, this opportunity would be gone. That's why this picture was taken during a lunar eclipse.